Due to the efforts of our talented friend Charlie at Doodlewash, July will now and forever be World Watercolor Month! Isn’t that the coolest?! It’s time for artists young and old around the world to splash in paint puddles and have fun! This is M. Graham watercolor (cobalt teal and Prussian blue) on a 5 x 8″ piece of 300 lb. Arches cold press paper. One of the reasons I love birds so much is they represent freedom to me. I’ve always wanted to be a bird…a seagull, actually. To live at the beach, and to be able to fly wherever you’d like to go, carefree and beautiful. This is what I’d like to achieve in my watercolors this month. A tall order, I know. But I’m gonna try my best. To NOT try my best. To be free, splash, make mistakes, learn something new, experiment to my heart’s content……in short, breathe. And be free. Speaking of freedom, it is Independence Day weekend here in the States, so I will be celebrating my freedom this weekend in more ways than one! I hope that you and yours are doing the Friday dance, and most importantly, I hope that you take some time today to do something just for you. Something that will make your soul sing. Peace, and enjoy the watercolor artwork this month! Beautiful and elegant, a lovely way to start an extraordinary month of watercolor. Thank you for sharing and enjoy the long weekend! Peace. You do the same, and thank you so much, Haunani! Thanks so much, Adrian; as a huge admirer of your work, your feedback means a lot! Thank you, Kerfe, and you the same! I do love the seagulls. Looooove it!!!! Freedom is our theme soul sista artinista mentor Laura loo! I love them simplicity yet bold clarity. A sure fire watercolor success!! Thanks, Jodi. I still haven’t decided what to even paint for tomorrow yet! But I’d like them all to be clean and simple and free yes, FREE! Thank you again for your encouraging kindness and I am so glad my nickname is Loo and not anything with the word mentor in it lol. I’m glad to have helped waken the artist inside you. With Jill’s help! She is a huge influence for me too, wouldn’t have ever got into acrylics without seeing her beautiful and bold stuff! I’m rambling. Thank you, and have a great Fourth! A beautiful way to start Watercolor month. Your bird signifies freedom for sure! Thank you, Teri. I have to look out with wc, it has stepped on my toes many times so I’m trying to focus on going with the flow this go-round. Really loved your post today too. This will be fun! Totally joining in on Watercolor Month!!! Fun. Love your dedication to creating. Peace to you. Thanks so much, Rebecca! This was stuck in moderation, sorry I just saw it! Glad you’re having fun too! Oh thank you for the heads-up on the free shipping….I might do my order today rather than waiting till next week. I also love birds, seeing them often will make me tear up, no joke! Trees and birds are my favorite and they go together. I’m so glad you love birds, Margaret! That really makes me happy. I love birds and trees too. I feel I am much better at drawing birds than painting them. I will keep practicing. I kind of like easy, free silhouettes like this one. I’m inclined to tense up at just the thought of a month of wc, so I’m trying to really relax and remind myself this isn’t an assignment. I can’t begin to expect perfection when I barely know what I’m doing, right??? So….yeah. Just trying to relax and pretend we’re painting in acrylics all month instead. lol. I need to place an order today myself, that is usually the lowest they go with free shipping, and I wanna take advantage of it. Thanks for your encouragement, friend. ❤ Keep painting those trees! Do you ever paint birds, Margaret? You too, and thank you, Snehal! ooh. Now that’s a cool one to be. Thanks, Deborah. This should be an interesting month with my one-sided love affair with wc hehe! He he, go for both? Love this painting! Looking forward to an awesome July seeing your work! Have a happy 4th of July weekend! In your honor Laura, I got out my watercolors today and watched tutorials. Trying my hands at leaves. 😁 negative technique for veins may be too much for me but I’m still practicing! You’ll get there with steady practice. That is key! Good for you! Thanks so much, Jill! I think for me sometimes simple is best. As you’ll see when you see today’s painting, the opposite of simple lol. I like simple, clean colors and lots of white, I think it really makes the watercolor paintings. If they don’t turn out that way, then I’m not as happy with them. I love that feeling you described of watching birds fly as it’s starting to get dark. What a wonderful summer feeling. Add a weenie roast, and I’m there! I can see the effortless flight seamingly gliding on air currents in your watercolor painting. Now that I’m sitting up longer, possibly, I’ll give watercolor a try. haha no doubt, thanks Donna! Wonderful; I do like the themes you have, especially the watercolor this month! Thanks so much! Glad you’re enjoying! 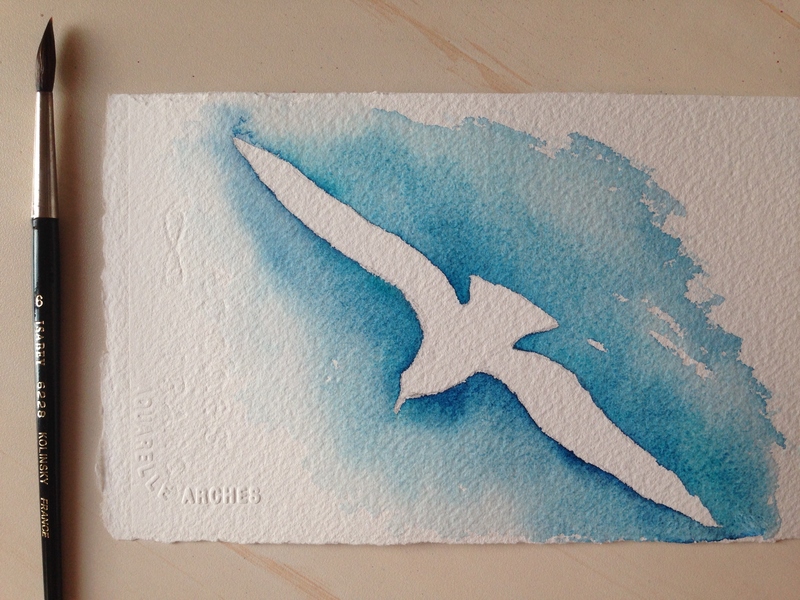 I love this Laura – remind me of Jonathan Livingston Seagull. Aww, thanks so much, Emily! I actually painted your hummingbird on the back of this one lol. I didn’t have much hope that it would turn out, but painting on dry paper (vs. on wet, the way I usually work) really helped. And your photo was huge! Love it! What a lot of work, but so worth it! What a beautiful painting! You capture that carefree, effortless feeling of the way gulls fly. I did not know it was watercolour month, but it’s a really good reason to improve my knowledge and use of them in the next few weeks. Thank you for your positive comments on my work. So glad you enjoyed it, and thanks for stopping by and letting me know! I hope you get time to play with watercolor this month too.